Wow! Lookie what we found in the warehouse! 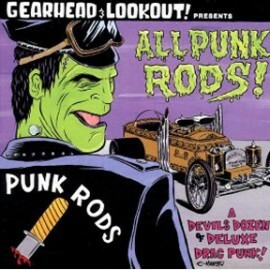 Released by Lookout Records before Gearhead Records was a record label! 14 tracks from The Hellacopters, The Dragons, The Donnas, Servotron, Man or Astro-man and more. Nomads "Let's Go To The Dragstrip"
The Splash Four "Nut Cop"
The Hellacopters "Long Gone Losers"
The Hi-Fives "Certain Year'd Something"
Man Or Astroman? "Updated Theme To Supercar"
The Donnas "Speedin' Back To My Baby"
Pee Chees "You Are Not"
The Smugglers "Rock And Roll Was Never This Fun"